Hello everyone. We’re on the countdown to New Zealand Babywearing Week (6 – 14 October 2012) and we are looking forward to celebrating with you. Over the next few weeks we will be continuing our fantastic giveaways thanks to some generous product sponsors. The next giveaway will be drawn once we reach 1500 page members over on the New Zealand Babywearing Week facebook page. Our 1500 liker giveaway sponsor is Little Love. One lucky ‘New Zealand Babywearing Week Facebook page’ member will be randomly drawn to win a Little Love Mei Tai in winner’s choice of fabric, valued at $164.90. (Open to NZ residents only). The Little Love mei tai can be used for front, back and hip carries, from newborn to toddlers, and is one-size-fits-all, making it a versatile carrier and great value for money . Made in New Zealand, Little Love Mei Tai Baby Carriers are a great solution for your baby wearing needs. Like the Little Love Facebook page. Update your Facebook status with the following: “I’m in to win a Little Love Mei Tai with @New Zealand Babywearing Week and @LittleLoveBaby. You will need to ‘like’ the New Zealand Babywearing Week and Little Love Facebook pages for the tags to work and remember to make sure your update is shared as ‘Public’. To do this click the drop down menu to the left of the ‘post’ button in your status update section on your wall and choose ‘Public’. Leave a comment under this post to let us know why you would like to win a Little Love mei tai. This entry was posted in New Zealand Babywearing Week and tagged baby carrier, baby sling, New Zealand Babywearing Week, NZ Babywearing Week. Bookmark the permalink. I’m new to babywearing and would love to win this for my four month baby girl! It looks great and so comfortable! Fingers crossed! I would love a Little Love Meitai because I lost the meitai I made and I would really love to have one again, meitais are great! I used the mei tai with my third baby from the day he was born until he was 4 years old. Then I gave to a friend. One year later, found myself pregnant again and I miss it so much….. Would love to have another one! They are the best carriers! A work colleague came in with her bub in the frida kahlo design, and I fell in love with your mei tai! Also how apt would it be to have my little love in a little love, she is 10 weeks old ! I’d love to win this as I’d love a carrier that is easy to swap carrying either of my girls and also easy to swap who is carrying them. Would be lovely to win this, I could use it for both of my boys 2yrs and 3 month old. Having a decent carrier is essential with a baby & toddler. I would love a carrier that goes to 20kg that also has a sun shade. after having a look at Little Love mei tai I can see they are stylish not only for mom but for dad as well and i would love to have a Carrier that Dad would be proud to wear. 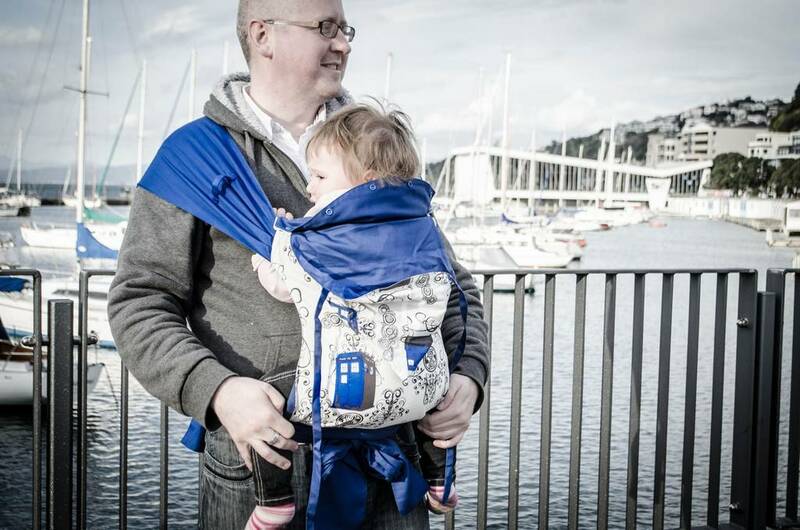 I could defiantly see my husband wearing our son if he had a carrier as awesome as the Tardis one that is featured. I want to win this for my husband! I would love to win a Little Love Meitai, they’re great carriers but I just don’t have the money to buy one without feeling guilty. These look like awesome mei tais, I love the wide straps! I would love to win one of these. I’d love to win this mei tai because I have the Babywearing Wellington Little Love Mei Tai on loan right now – and I really don’t want to give it back! I would absolutely love a Mei Tai. I have never tried one, but they look so comfy!! I’d love to win one so that I could donate a *good* carrier to our Playcentre. Babies often have a hard time sleeping at Playcentre, so much is going on, but then they will fall asleep held or in a carrier. We have lots of babies currently at our centre (6 born this year!) and while several of the mums (myself included) have been able to get a good SSC for our babies, others are not in a financial position to do so. It\’d be great to have one that belonged to our centre, so that any mum with a baby on session could use it. I’d love to win a Little Love Mei Tai for the Dunedin Sling Library to be launched during NZ Babywearing week. We don’t have a Mei Tai yet. Would be absolutely thrilled to have this for our very soon to arrive addition to the family. Sounds a fantastic carrier!! I’d love to win a Little Love Mei Tai, to help raise awareness of a great local business and I think the style is fantastic!! I’d love to win – they sound great!!! I would love to win a Little Love Mei Tai. After attending a Baby Wearing Workshop, and purchasing a Manduca, my husband has decided that 2 carriers would be a fantastic idea. One for our two year old and one for our soon to be new born. I would love to win it…. It looks like a very comfy carrier! Winning a Little Love Mei Tai would be awesome! We have an Ergo from Canada, and I’d love to be able to wear baby #1 on the front and #2 on the back — talk about a super momma! I want to win a little love mei tai because I know that when my little girl arrives, my boy is going to remain super active and I’ll need to find a way to keep up with a newborn in tow! I would love to win this….my 6th baby was born at 23 weeks a year ago this weekend. He has CP, chronic lung disease, failure to thrive, developmental delays and a significant brain injury, because of all this he is going to take a long, long time to get to walking….he loves been snuggled close and this would be perfect!!! I used to have a Moby and my little one is growing out of it. I think this will suit us perfectly and will be something I just fall in love with! When my Little girl was six days old I sat down and sewed a tiny prem sized mei tai for her. Needless to say she is alot older now and definately not fitting it any more. I have recently given away our mini monkey sling as it just wasn’t working for us at all. I would love the opportunity to win this Mei Tai from Little Love as I don’t drive and to be honest my girl LOATHES her pram as it means less Mummy snuggles!